The 2016 Summer Reading Program has now ended. Thank you to our 450+ participants for spending some of your summer with us. We look forward to seeing you again at the library! On Your Mark, Get Set, Read! The 2016 Summer Reading Program celebrates sports, exercise, and good health. Children ages 14 and younger may register in the Children’s Department of the Uniontown Public Library beginning June 6, 2016. Children who are too young to read can still participate and may have books read to them. Each participant will receive a reading log to record the books they read during the summer, as well as a bookmark with a free children’s menu item compliments of IHOP. When they reach their reading goals, they will receive prizes. 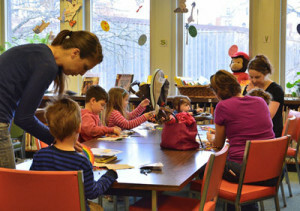 One day each week, all readers are invited to attend a special event at the library for summer reading program members. Participants are also invited to enter the art and math contests. Summer is the time to have fun! Read any age-appropriate book that you like. If you need some help choosing a book to get started, talk to the librarian. Support for the Summer Reading Program is provided by the Friends of the Uniontown Public Library. READ 1 BOOK: Choose one of our sports wristbands sponsored by Duck Hollow Discovery Learning Center and a free taco from Taco Bell. READ 5 BOOKS: Earn an adorable Sports Ducky sponsored by Duck Hollow Discovery Learning Center and a free Happy Meal from the McDonald’s at Uniontown Shopping Center. READ 10 BOOKS: Win a sports beach ball, IHOP certificate, AND $10 in library money to spend at our Book Fair. Sponsored by Duck Hollow Discovery Learning Center and the Friends of the Uniontown Library. READ MORE THAN 10 BOOKS: Readers will receive a colorful sports whistle sponsored by Duck Hollow Discovery Learning Center and a coupon for a free dinner at Applebee’s Restaurant. MATH CONTEST: Guess how much popcorn is in a jar and win a refractor telescope. Sponsored by Debbie Teets. ART CONTEST: Create your own great meal and compete for prizes! Participants will be divided into five age groups. Pick up your entry form and rules at the library. You can see the prizes in the display case outside the Children’s Library. Sponsored by Linda Jennings and Lorraine Jones. MAKE-AND-TAKE CRAFT TABLE: Make a new craft each week. Sponsored by Dollar General Stores. TREASURE HUNT: Everyone’s favorite summer program activity. Find one of the golden coins hidden in the Children’s Library and bring it to the desk for a prize! Sponsored by Paula Wardzella. PUZZLER: Solve the weekly puzzle and win a prize. Sponsored by Dollar General Stores. June 23rd: Carnegie Museum of Natural History presents a live animal show, Be a Herpetologist. Learn about the world of exotic reptiles! The first show will begin at 1:00 PM, while the second will start at 1:50 PM. Registration is required. Sponsored by a grant from the Carnegie Museum. June 30th: The Stage Right Players from Greensburg will perform the play Olympig. Lots of fun for the little ones! Sponsored by St. Peter’s Lutheran Church and the Friends of the Uniontown Public Library. July 7th: Paleontologists Mike and Roberta Straka will bring real skulls from a Triceratops and an Albertosaurus. They can answer all your dinosaur questions! Sponsored by St. Peter’s Lutheran Church and the Friends of the Uniontown Public Library. July 14th: Doc Dixon the magician and his bunny will entertain and amaze you! Sponsored by St. Peter’s Lutheran Church and the Friends of the Uniontown Public Library. July 21st: The Mad Scientists from Pittsburgh will help you do some cool science experiments. Prepare to have loads of fun and also learn a thing or two! Sponsored by St. Peter’s Lutheran Church and the Friends of the Uniontown Public Library. July 28th: Craft Day! Spend some time being creative and enjoy a snack, too. Sponsored by St. Peter’s Lutheran Church and the Friends of the Uniontown Public Library. August 4th: Our popular Children’s Carnival and ice cream sundae event. Play games, win prizes, and eat ice cream! Sponsored by St. Peter’s Lutheran Church and the Friends of the Uniontown Public Library. The Book Fair is open every Thursday, Friday, and Saturday July 28th through August 6th. Note that the Book Fair will be operating from 11:00 AM to 2:00 PM this year.